Truffles are often touted as the most expensive ingredient in the world. The “black diamonds” of the earth retail for about $3,000 bucks a kilo. Avo’s are going for about $10 a kilo at the big supermarkets, so truffles must be prettay, prettay, prettay special. To clarify, we’re not talking about truffle chocolates here. Truffles are a type of fungi that grow underground, and they’re notoriously tricky to grow, just as difficult to find, and (once harvested) have a short shelf life. But chefs and connoisseurs all over the world are falling for this pungent mushroom. But y tho? And should you care? And if you do, where can you try them? If you had a hard time keeping that basil plant alive, spare a thought for all the truffle farmers out there. To grow a truffle, special fungi spores are injected into oak or hazelnut trees when they’re baby seedlings. The trees are planted a good distance apart, and as the truffles grow, they attach themselves to the tree roots via fine filaments. Truffle growing is a slow-burn investment. It takes about 3–4 years for truffles to show, and successful crop depends on a volatile combo of good climate, good soil and sheer luck. Some farms have large yields, and some don’t have any at all. The truffles have a special “you scratch my back” deal with the host trees—the truffles enhance the trees’ ability to gather nourishing phosphorous from the soil, and the truffle gets to feed on the tree roots’ glucose. Does that make the tree a sugar daddy? Maybe. This got weird. Truffle hunting is like a delicious game of hide and seek. They hide underground, so farmers rely on animals to sniff out the treasure. Pigs, with their sensitive noses, are especially good at finding truffles, but they have good taste. Once they find a truffle, they dig it up...and eat it. However, dogs can be trained to sniff out the prized fungi, and sit or paw at the spot where the truffle lurks beneath. No particular dog breed is best suited for the hunt—they all have truffle-hunting potential (there’s even a small, niche industry where you can send your pooch to “truffle school”). Even then, farmers still have to get on their hands and knees to smell the dirt. Once truffles are detached from their host trees, they don’t ripen any further. So, it’s up to the farmers to make the call about whether the truffle is ready for picking. In this part of the hemisphere, truffle growing is booming. New Zealand produces between 100–200 kilograms a year, and the industry is picking up. Australia’s initial harvest in 1997 yielded just one kilogram; by 2016, this grew to 13,000 kilos. The Australian Truffle Growers Association estimates that by 2020, we’ll be producing 20,000 kilograms of the stuff, of which about 75 per cent is exported to the hungry international market. There are around thirty truffières (truffle farms) in New Zealand, and 160 or so in Australia. Truffles like warm summers and frosty winters, so the majority of Victoria and Tasmania is optimal for truffle-growing. Additionally, the small town of Manjimup, near the southern tip of Western Australia, produces some revered truffles. In New Zealand, the largest concentration of farms can be found in the North Canterbury region. A clump of dirt, really. Others say they look like knobbly poop. Don’t shoot the messenger. The truffles you find in our restaurants and farms are most likely black Périgord truffles, an introduced variety from Europe. If you’re extremely lucky you’ll come across the more expensive, much luxe Italian white truffle, though these have yet to be grown successfully in Australia nor New Zealand. TBH, you’ll smell their trademark aroma before you taste them—it’s pungent and earthy, funky and musky. To me, they smell “brown” and otherworldly. Truffles are a natural glutamate, meaning they’re packed with umami goodness. To say they taste “mushroomy” is an understatement. It’s like a complex uber-mushroom layered with blue cheese, garlic, and an addictive “savouriness”. They make good friends with warm creamy flavours: scrambled eggs, pasta with buttery sauces, risotto, lobster. They’re best served simply, just shaved over your dish of choice, and a little bit goes a long way. And please for the life of Yeesus, do not use truffle oil. It doesn’t have any real truffle, just weird synthetic “truffle aroma”. That stuff is naaaasty. Loosely, truffle season runs from mid-June to August. They’re here for a good time, not a long time. Book yourself into these restaurants that are promising these truffle feasts and dishes. The Grill by Sean Connolly hosted a sold-out Truffle Shuffle lunch in August 2017, so fingers crossed they’ll be doing it again as part of this year’s Auckland Restaurant Month! We suggest you keep a close eye out. Bacchus, South Bank. A truffle degustation, featuring much-loved friends such as prawn, egg, risotto and beef. From $179. 26 June to 4 August. OTTO, Brisbane CBD. 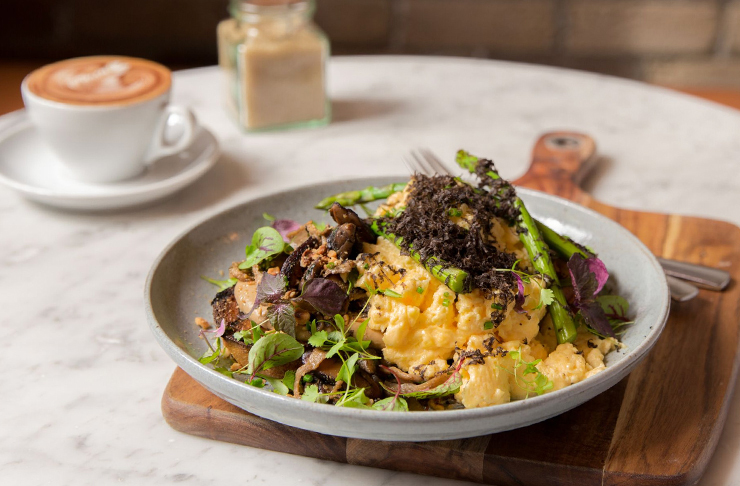 Like their Sydney venue, OTTO is serving up five grams of black Manjimup truffles, shaved over your dish of choice for $30 (and you'll get some cheeky chocolate truffles to take home for later). 9 June to the end of August. OTTO, Woolloomooloo. A $25 add-on “truffle service” to your chosen dish (the truffle is brought to the table in a glass cloche). 9 June to the end of August. Devon, Surry Hills, Barangaroo, North Sydney. A truffle menu for breakfast, lunch and brunch. Go for the sea urchin pasta at the Surry Hills eatery. Available from 8 June. Mr. Wong, Sydney CBD. For $5 a gram, they'll grate truffles over your chosen dish at this Cantonese-ish restaurant. Three Williams, Redfern. A breakfast/lunch menu of seven truffle dishes, including the popular Peking Duck angel hair pasta. Available from June to August. Chiara, Melbourne CBD. A special Italian menu featuring truffles...and you can add on extra truffles for $12 a gram. Available throughout June. Philippe, Melbourne CBD. A six-course dinner by the truffle king himself, Philippe Mouchel. $180pp, Friday 15 Jun, 6.30pm. Tipo 00, Melbourne CBD. The Italian diner is offering a delicious mushroom risotto with shaved black truffle, available until around the end of August. Truffle Melbourne Festival, Queen Victoria Market. A festival of affordable truffle dishes. Truffle mac and cheese, anyone? Saturday 16 June, 9am–3pm; Sunday 17 June, 9am–4pm. Want to tackle French rosé next? Of course you do.